No Pot of Gold at the End of THIS Rainbow! ANNAPOLIS, MD (June 04, 2017) – Although it is an attractive herbaceous perennial named after Iris, the Greek goddess of the rainbow, yellow flag iris is a wolf in sheep’s clothing. Because of its invasive tendencies and negative impacts in natural and agricultural systems, Iris pseudacorus, commonly known as yellow flag iris, yellow iris, water iris, or pale-yellow iris, is illegal to buy or sell, transport or transfer in Maryland as of April 12, 2017. And because the plant blooms in late spring and is visible now, the Maryland Invasive Species Council has chosen Iris pseudacorus as the June Invader of the Month. Yellow flag iris is a beardless iris that grows from a rhizome, a thick underground root, and can be difficult to differentiate from the native blue flag iris, I. versicolor, unless in bloom, as it is the only iris that grows completely yellow in a natural environment. Its sword-like green leaves have a bluish gray cast with a central ridge on both sides and can grow up to four feet tall. Several yellow flowers bloom on the peduncle, a long erect stem, in early summer. 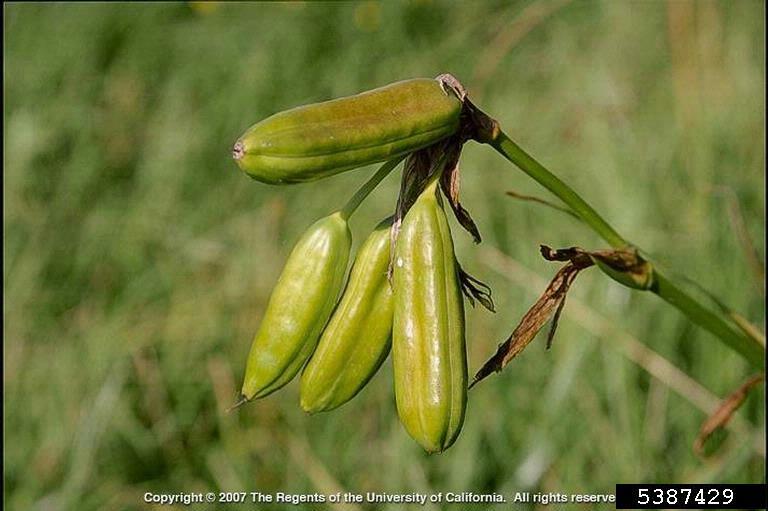 The fruit produces approximately 120 seeds and is a six-angled egg-shaped capsule, differing from the blue flag iris capsule, which is only three-angled. The pink fleshy rhizome grows vertically up to 4 – 8 inches deep with a diameter up to 1.5 inches and can form extensive clumps due to its freely branching characteristics. I. pseudacorus is native to Europe, the United Kingdom, North Africa, and the Mediterranean and has been introduced to the United States, Canada, Argentina, Chile and Uruguay. The plant was brought to Eastern North America as an ornamental plant as early as the late 1700’s, spreading to the western United States by the 1950s. Originally planted as an ornamental, it has also been used for nutrient removal and sediment trapping in sewage treatment plants and erosion control. Unfortunately, all that benefit is overshadowed by its invasive traits and toxic compounds. The thick rhizome mat created by the plant prevents seeds and seedlings of other species from establishing and collects sediment, which improves the environment for the iris by raising the topography and creating a drier environment. 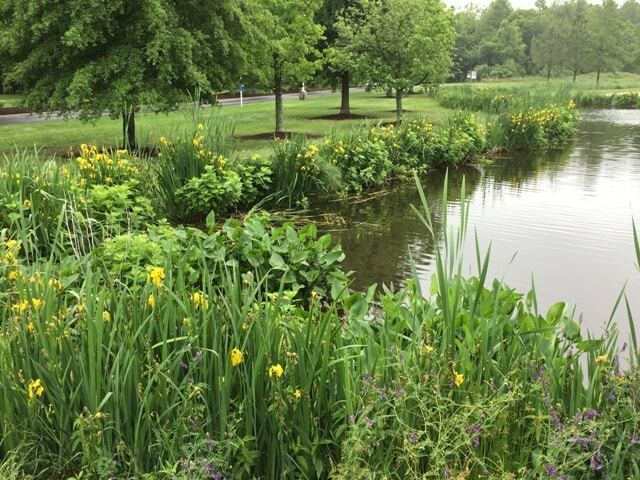 Yellow flag iris can clog irrigation systems, drainage pipes and flood control ditches, and alter rivers and streams by trapping sediments. 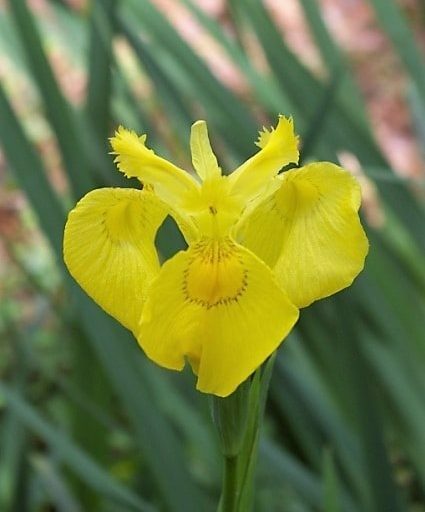 In addition, yellow flag iris can outcompete some of Maryland’s threatened and endangered plants such as spiked beakrush and small-fruited beggarticks. Iris pseudacorus requires repeated efforts to control. Small infestations can be dug or grubbed out by hand. Larger infestations often require the use of pick axes or shovels to completely remove the rhizomes. For infestations in standing water, hand or mechanical removal may cause unacceptable disturbance of the substrate. Repeated cutting of the above water leaves and stems can result in good control, as this weakens the plant and pulls reserves from the roots. This control method may take several years. 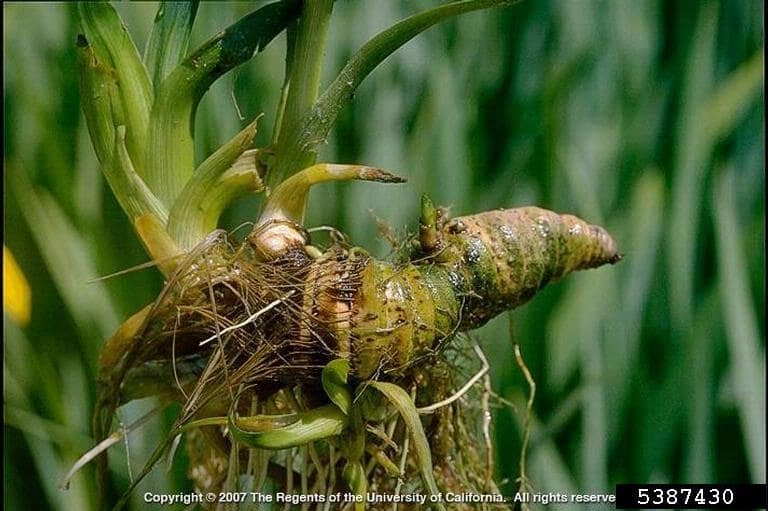 The plant resprouts from rhizomes, and since those can go several months without moisture, it is best to remove them from the infestation site and dispose of them safely. Neither burning nor grazing is effective — the former because the plant resprouts, the latter because it is toxic to grazers! Herbicides such as aquatic formulations of glyphosate or imazapyr provide effective control. There are no known biological controls for yellow flag iris. Not surprisingly its seeds are not dispersed by birds! Instead this plant has a dual strategy for reproduction which enables it to easily spread. The seeds are very buoyant and can float for up to two months and last in high salinity for over a month, allowing it to travel great distances before establishing. In the second strategy, rhizome fragments created by a disturbance will travel with the current, making it easy to root in new locations downstream. I. pseudacorus is a hardy plant and can grow in challenging conditions, enabling it to establish in many riparian and wetland environments It tolerates fresh or brackish water, neutral to high acidity, low levels of oxygen and either wet or dry environments. I. pseudacorus can grow for months without water. Morgan, V.H., L. Berent and A. Fusaro. 2017. Iris pseudacorus. USGS Nonindigenous Aquatic Species Database, Gainesville, FL. Sutherland, W.J. 1990. Iris pseudacorus L. Journal of Ecology 78(3):833-848. Office of Plant Industries and Pest Management. Weed Risk Assessment for Iris pseudacorus L. (Iridaceae) – Yellow flag iris. Maryland Department of Agriculture. Annapolis, MD.